Eating towawrds your goals shouldn't force you into one "ideal" macronutrient ratio. That's why we've created an entire line of baking accessories. Finally, you can customize your shake or #CheatClean recipe to take control of your nutrition without compromising on taste. Add in fat and carb sources the way you want, when you want! Now there's an easier way to get coconut oil into your diet. 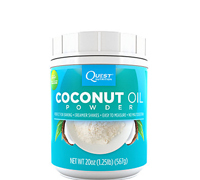 Our powdered cocnut oil has zero grams net carbs per serving. It's simple to measure the exact amount you want without the mess and guesswork of traditional coconut oil. Make the recipes you want with the macronutrients you need! No Soy, No Added Sugar, Gluten Free.